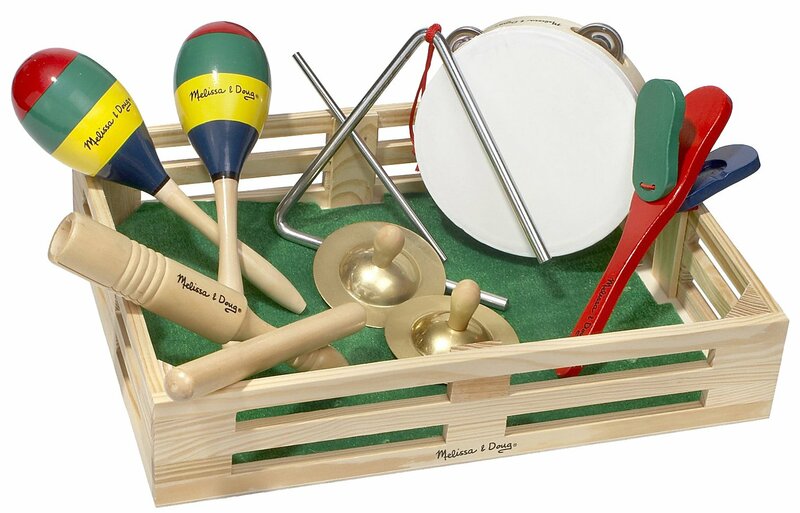 This is the summary of consumer reviews for Tiny Love Super Deluxe Lights and Music Gymini Activity Gym. The BoolPool rating for this product is Excellent, with 4.60 stars, and the price range is $42-$64. My daughter is almost 4 months. I feel sure that my daughter will be able to play with this toy for at least another month or two. My daughter loved this play gym! It's a little short and my 4 month old daughter kept hitting her head when she was on her belly. I bought this gym/playmat when my daughter was 3 months old. My daughter (now 6 months old) uses this everyday. My little one has been playing with this since she was about a month old. She's still loving it at 3 months old and is now learning to grab onto the hanging toys. My little girl is now 6 weeks old and loves this play mat! 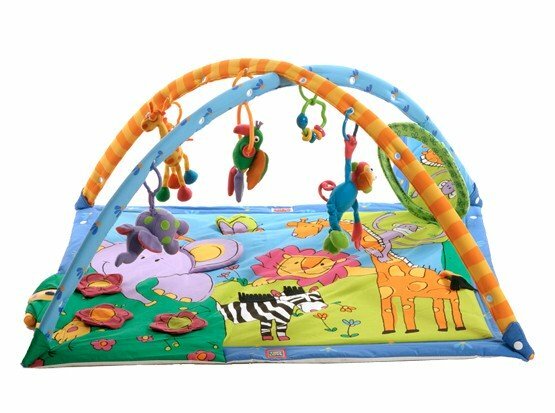 It's easy to set up, very colorful, has lots to keep your infant engaged, is washable (the mat), and actually seems to keep our baby even happier! There's alot of fun features for baby to look at,especially the large mirror. 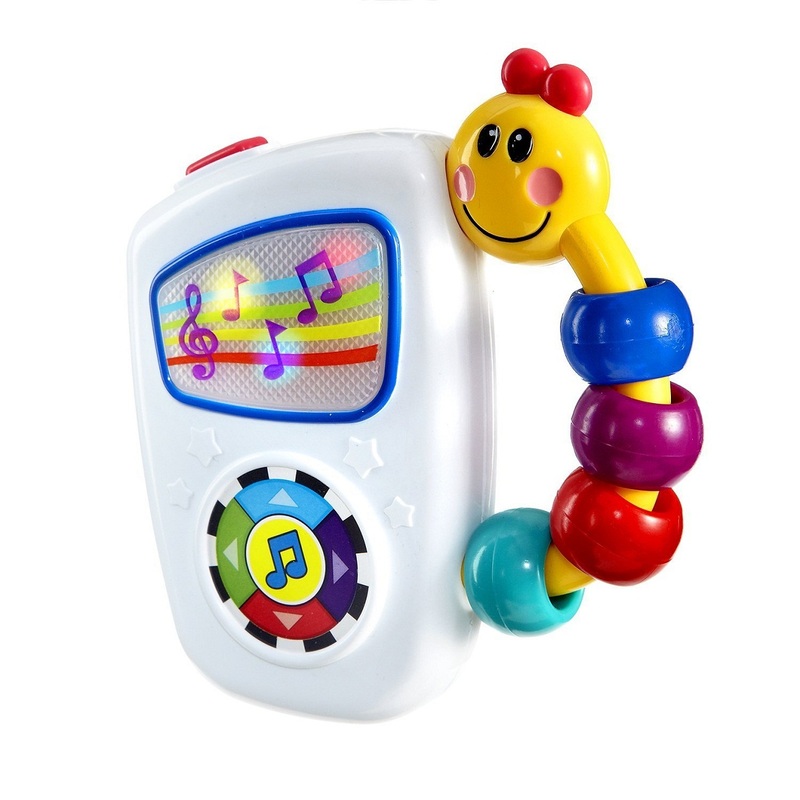 The toys are removable which is great for letting baby hold them or attach to other items. The babies play for hours. It's numerous hanging animals (each one does something different), so the baby always seems to have a "new toy". (rattle, crinkle, pull toy, teething) They can be easily removed by parents for on the go fun but probably not easily removed for the baby, which I think is good. I didn't put all the toys on at the same time when my baby was an infant, it seemed like too much. This baby gym exceeds expectations. this gym probably cost a little more than other gyms for babies but it's fully epuiped,it's mirror,music and light as well as lovely colors. I thought it'd be more to keep baby entertaned on it the lights are no good and there just isnt enough music to get baby interrested in it. We use it several times daily for play and tummy time. He plays and gives his parents time to get things done around the house for half an hour at a time, and the mirror encourages him to push his head up during tummy time. I also washed this item several times (my youngest son had reflux and he spit up on it quite a few times) yet it lasted extremely well. Our son hates tummy time (hates it! ), and this's the only thing we've found that'll keep him from starting to wail within the first five minutes. The music and lights are great for encouraging tummy time and the pull down toys are fantastic! My son is now 4 months old and we use it everyday!. Our four month old has enjoyed using it for tummy time as well as for building her eye-hand coordination. Our son is 3 1/2 months old now and he loves the Gymini. I bought this for my son when he was about 2 months old. We'd originally purchased a different Gymini without the lights and music, and my 2 month old son rejected it completely. I also bought him every other toy I saw that looked cute. This was the first toy my son truly interacted with. I bought this for my son before he was born, just because it looked cute. The toys are all so different that my son never gets bored. 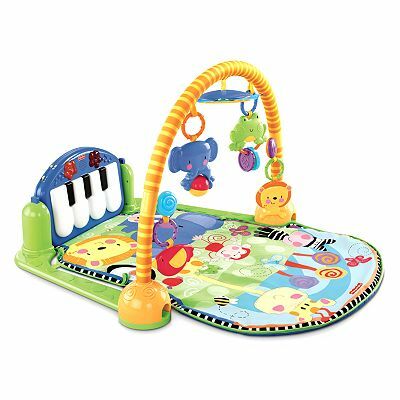 What makes this mat very nice is that you can buy additional hanging toys for it and change things around so baby doesn't get bored. We bought this about 3 weeks ago and our baby loved it. He loves looking at himself in the mirror and, in fact, the first time he rolled up on his side was to get a better look at it. When he was around 2 months old, he liked to be on his back and look up at the colorful toys. Yes, it's colorful toys that can easily be moved to various locations and the mat is nice to look at if they're on their tummy. My son, by a couple months old, had to keep his face to the side because he didn't like the toys touching him. That said, my baby does love the crinkly elephant ear and the hanging monkey and giraffe toys. Pros: Mat is large, interesting features on it (flaps, crinkle materials), easy to grab toys. We also have the Baby Einstein mat-cheap toys, small mirror and small mat. As he got older he liked the different textures on the mat (Zebra's mane, crinkly ear) and the toys. I decided on this mat over the Baby Einstein mat (the one w/ the star) because it received multiple children's toys awards. During tummy-time, the mat offers a crinkle elephant ear that also hides a bird for "peek-a-boo" play. -daughter really likes the toys that hangs (fyi the elephant vibrates when you pull on it..i didn't know this until several months in). The mat is machine washable and has a lot of features. My baby LOVES this toy. I chose to buy this mat beacause my baby is very big and I thought this mat looked much bigger than the other ones. My baby started playing on it around 6 weeks old. 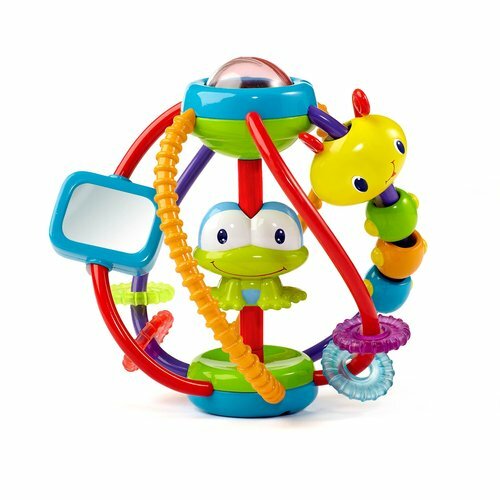 This toy really entertains baby for hours and there are so many ways to play on it. He loved playing on this toy. There are a lot of toys to play with. My baby loves playing with the little animals, the minute I put her there she starts smiling! Plus, once you put the baby in the gym, the toys are dangling way too close to baby's face,which makes a little baby (1-3 months) a bit confused. We first had the Whoozit Gym to Go by Manhattan Toy Company and found that baby couldn't reach the toys. He started playing on it at 5 weeks old and still plays with it at 6 months. The toys are low enough to play with and my baby was just hitting them and having a blast at 3 months old and now that he's 4.5 months he grabs them and holds on to them. Its great for tummy time, when they start lifting there head the toys do touch them but it didnt seem to bother my son.